DSM Tool sends feedbacks and requesting feedbacks from your buyers automatically. This feature automatically sends a message to your buyers after the order had been made. Once the tracking number had been added and 7 days after, it requests for a feedback. You can find the settings for this feature in the Account Settings of your DSM account, under Sales and Order tab. There are editable message templates for every category that you can personalize. 1. 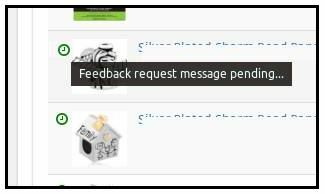 Feedback request messages appear as a clock icon in the Sales & Profits page, clicking on the green clock will pop up the option to cancel the automatic feedback request. 4. 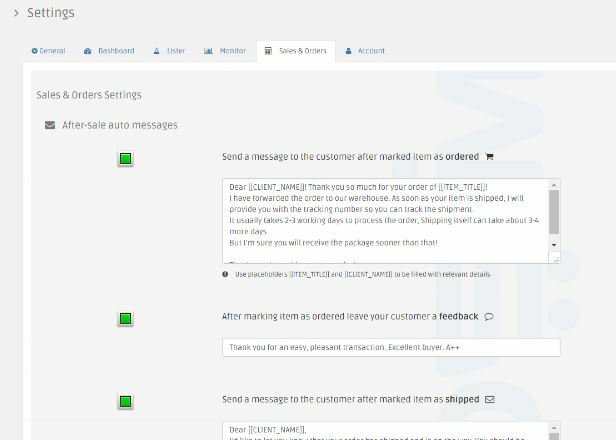 If your buyer leaves you a feedback before it is automatically requested, DSM Auto Messages will not send the feedback request message automatically.